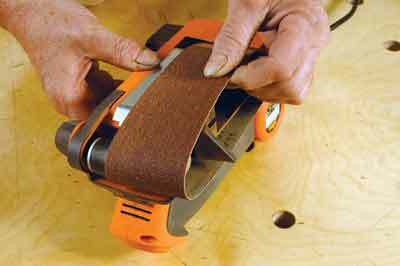 This machine is actually a belt sander although the term 'palm' usually refers to an orbital sander. This baby needs a palm grip to hold it one-handed as it doesn't come with a sanding frame and the bed size is relatively small. However, its small size seems to work in its favour because when fitted with medium abrasive, it has a good rate of attack but doesn't seem to suffer from 'dig-in', as you might perhaps expect. 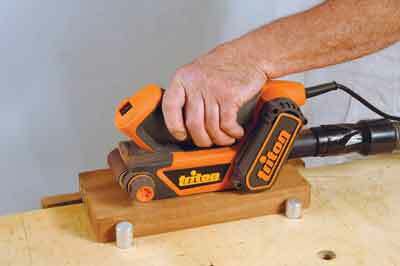 It isn't the machine for sanding veneered board or fine quality surfaces but as a site tool or for sanding narrow board, such as door stiles and rails, it seems like the ideal tool where serious levelling is required. It needs extraction because dust certainly gets ejected during sanding. The palm grip is not uncomfortable and raises the possibility of sanding in-situ vertical surfaces, which one would never attempt with a big, heavy sander. There is a belt tracking knob although it doesn't need much adjustment with such short running belts. All in all, a very solid piece of kit that should handle some abuse and still deliver. Another plus is that it doesn't take up much room in the site kit. No load speed: 340m min.